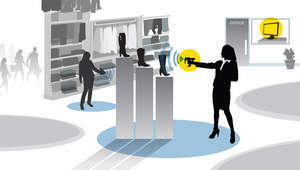 NEUHAUSEN, SWITZERLAND--(Marketwired - Apr 15, 2015) - As the retail industry undergoes transformation, RFID has emerged as a critical, enabling technology for retailers competing in an omni-channel world and a cornerstone for the retail Internet of Things (IoT). With proven return on investment and defined use cases, RFID powered solutions from Tyco Retail Solutions are in place today at over 2,500 stores, representing some of the world's largest retail brands. From pilots to large store deployments, forward thinking retailers like Inditex, Macy's and Chico's FAS, Inc., understand the critical role of RFID to maximize revenue, improve store operations, and meet the demands of today's consumers. Learn more about how Tyco Retail Solutions RFID solutions are helping today's leading retailers. Increased speed to ROI -- from expanded and proven RFID use cases. According to the new Kurt Salmon RFID in Retail Study, which surveyed 50 leading U.S. softlines retailers, RFID adopters measuring ROI have seen gross margin improvement of more than 5% in some cases. As these stores become more saturated with RFID tagged inventory, second generation use cases are becoming viable. In fact, 42% of respondents reported 1% to over 5% increase in gross margin from using RFID to support omni-channel fulfillment. Additionally, 60% of respondents reported 1% to over 5% increase in gross margin achieved from using RFID to improve backroom to selling floor inventory accuracy and replenishment. "RFID has become a critical foundation for success in today's retail environment," said Nancy Chisholm, President, Tyco Retail Solutions. "Anchored by effective use cases and proven returns, our RFID powered solutions are gaining global momentum. We will continue to help unleash the benefits RFID offers retailers worldwide and to support the advancement of this critical IoT application." More RFID use cases beyond basic replenishable items are driving ROI for today’s retailers.